I started out at 6:30AM to go look for wildlife. No luck. I got to the Lamar Valley just after sunrise and it was completely fogged in. So I turned around and headed to Crystal Bench to collect soils. We can use these as a comparison to invaded soils in the Gardiner Basin (~30 miles as the Raven flies). Although they have different geological impacts over time it is a dry winter range site that can be used as a benchmark for the restoration project. 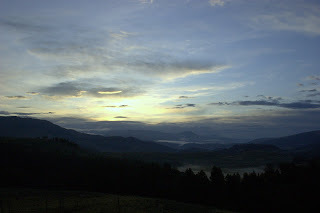 I got the sunrise picture below from the Crystal Bench site (Just off of the Lamar river). Then I went to look for Alyssum desertorum using GPS coordinates from Montana State. We tried to find them this past spring but ran in to a grizzly on the Lamar and that ended that pursuit. Well unfortunately I was successful today. The site is covered with A. desertorum and it's cousin A alyssoides which goes to seed in the fall. It is patchy from the road to the Lamar river but is covering an area of about 5 acres and I suspect it will continue to spread. The picture below shows A. desertorum in the foreground as all of the short light tan stick like objects. I collected soil cores and surface soil samples for seed bank/germination estimates. Since I was out in the park and had some time I decided to head towards Yellowstone Lake via Dunraven Pass/Mt. 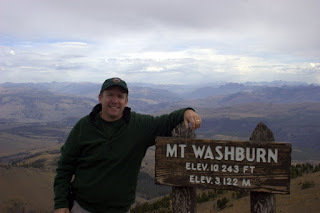 Washburn to look for Elk and Bison. As I got close to Mt. Washburn I decided to go to the fire outlook on the top. It's always closed in the spring so now was my chance to get to the highest point in the park. It is a 2.8 mile hike up an access road that is used by the Rangers that staff the outlook. There is a more difficult route up the front side of the mountain but it was closed due to grizzly activity. I took my bear spray and headed up at 9:50 AM and figured I could do it in one hour. After the first 1000 yds I thought I was done. Going from 1100 ft in Lexington to 8800 feet can take it out of you. But I turned it around and made it to the top at 10,243 ft in just under 1 hour. The weather turned nasty with rain/freezing rain, so I didn't spend much time at the top but I did meet a nice couple from Canada and they took my picture. Of course a quarter of the way down the sky opened up to blue but it made for a nice descent. 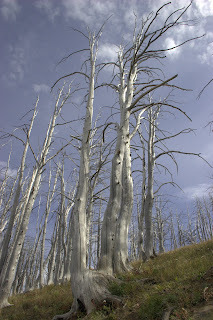 You can see the blue sky in the photo of fire killed trees below. I then headed further south towards the lake into the Hayden Valley hoping to see large herds of bison or elk. I did come across a huge herd of bison ~300 crossing the road. No pictures I have plenty of those. I turned around and headed for the Gardiner Basin to start sampling the exclosure. It will be seeded with winter wheat on Thursday and I want to get a thorough sampling of the planted and now dead barley biomass, plus sample the areas where the barley didn't grow but A. desertorum did despite herbicide treatment. 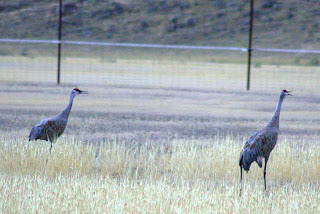 One interesting outcome of the fence and the planting of barley is that a pair of sand hill cranes now spend a large portion of their day feeding on the large number of grasshoppers as well as the barley seed heads. In the picture below taken at 7 this evening the male is getting a little upset with me getting too close and is letting out a loud warning call. 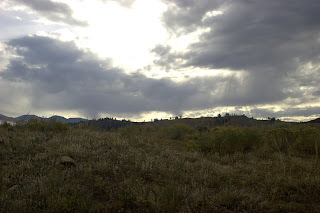 Tomorrow more sampling and a talk for the Yellowstone Center for Resources and USDA-NRCS.